i haven't really been doing the challenge, but i've been enjoying your posts about it! i did end up wearing a skirt today, but that's really not unusual for me. i'm almost constantly in skirts, and it's unusual for me to wear jeans. I thought it was jazzing up jeans and a teeshirt, not just jeans? Ah! I definitely just took part in this challenge unawares :) Best of all, with $2 denim! I really do LOVE dressing jeans up, just because it's so against the grain that it's fun, eye-catching, and makes you feel like you made something new in fashion. I have the same question as sparklesparklesparkle. 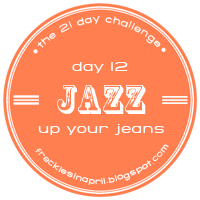 Didn't the prompt posted last week say it's jazzing up jeans and tee? So excited for jean weather again!! These are great inspiration! Sorry guys, I screwed up. I MEANT for the prompt to just be jeans but mistyped and didn't realize it. I've been giving the prompt wrong to everyone! You can do whatever you want..jeans and a tee, jeans and a button up..whatever, as long as you're wearing denim! Ah. Glad we got that cleared up. Thanks Kayla! I love Kendi's take! (Of course, pretty much every look she puts together is great!) I'm more of a cardigan and pretty top person than a button up person, so maybe I need to branch out to those. Thanks for posting these! I just found your blogs and I really love these challenge ideas. I will be following and participating.